Is it possible for an earth-bound girl to fall for a vampire? Welcome to the world of magic, riddles, and unmanageable contradictions! Explore numerous breath-taking locations, collect vital objects, and solve mind-bending brain-teasers as you become witness to an extraordinary love story that’s sure to touch your heart and blow your mind! Is it possible for an earth-bound girl to fall for a vampire? 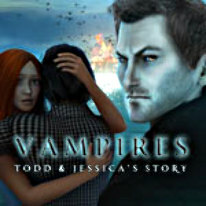 Find out in Vampires: Todd & Jessica's Story...and sink your teeth into it!